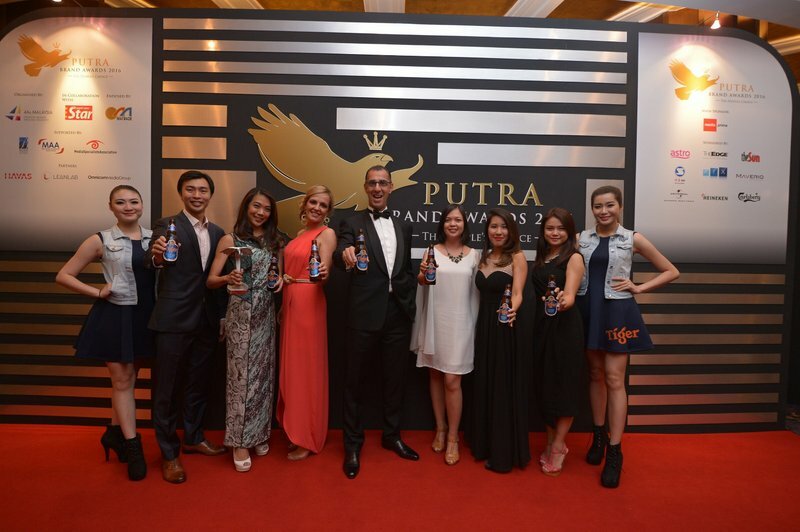 Tiger Beer celebrates another successful year with a silver in the ‘Beverage-Alcoholic’ category at the Putra Brand awards ceremony held at Majestic Hotel, Kuala Lumpur yesterday. Introduced in 2010 as an extension of the Malaysia’s Most Valuable Brands (MMVB) programme, the Putra Brand Awards is a prominent annual brand valuation and recognition exercise organised by the Association of Accredited Advertising Agents Malaysia (AAAA). It is an award based on consumer preference measured by brand relevance and usage intent. The brand’s marketing manager Jessie Chuah said that the award is testament to the efforts the label has strived to achieve for its valued consumers. “We are proud that our efforts in positioning our brand as a favourite brew in Malaysia have once again been recognised. The award attests that Tiger Beer and our range of innovative and creative brews, and our campaigns have resonated with our fans. It’s evident that we’re heading in the right direction as we deliver quality and relevant products while uncaging consumers’ passion for music, art, football and food. Thank you Malaysia for joining us on our journey, and continuing to raise your glasses with us,” Jessie Chuah said in a statement. Tiger Beer continues to bring its discerning drinkers exciting initiatives and new products like its latest innovative brew, Tiger White – Asia’s Wheat Beer, a beverage that came two years after another innovative product, Tiger Radler. Launched last October, Heineken Malaysia Berhad continues to be the only brewery in the world to produce Tiger White, a smooth and refine beverage made with subtle spicy hints of clove, coriander and orange peel. The label has shown it has the tenacity to expand its portfolio and will keep on bringing to its fans more innovative products. On the campaign front, Tiger Jams – a music and art initiative – is the brand’s latest music and art platform that called upon undiscovered musical talents to submit an original track at the www.tigerjams.com website. A panel of curators then shortlisted the submissions to identify 10 of Malaysia’s finest undiscovered musicians, who were voted into the top three via an online poll. The top three acts stand to win RM15,000 each, and the opportunity to collaborate with regional and international acclaimed artistes in both art and music platforms. Tiger Jams finale is set to take place this Sept 2 with performances by all three acts, their regional mentors as well as Scottish synthpop band, Chvrches, a collaborator. Tiger Bites, a campaign that uncages hidden street food gems, is set to make a big comeback following the astounding reception last year. Also returning is Tiger Beer’s football arm, Tiger FC, which will continue its search for its ultimate football fan. This 2016/17 season marks the club’s 13th year as a host to footie screenings, uniting like-minded fans for the love of football. For more information of Tiger Beer and its events, log on to www.facebook.com/TigerBeerMY. This entry was posted in News and tagged award, heineken malaysia, putra brand, tiger beer by TheGoodGoodGuy. Bookmark the permalink.